Do you ever have those moments where something happens and you’re like “Woahhh – WEEEEIRD” – coincidences always blow my mind! 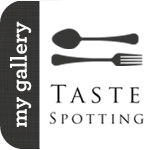 Last week, I was cyber-stumbling over all these great looking recipes that I wanted to try. One of them being from Erin at Naturally Ella for Roasted Tomato and Corn Salsa. 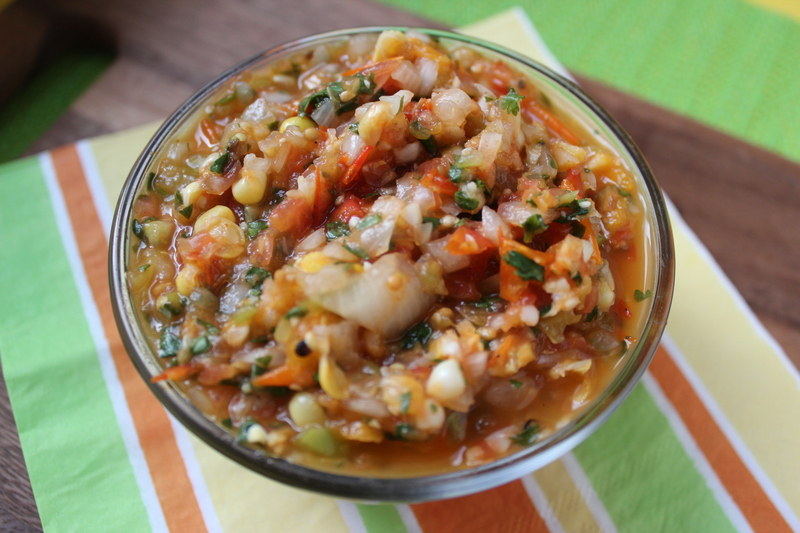 I love fresh salsa, especially in the summer time. I could eat it with a spoon, a fork, a knife, but prefereably with nice salty tortilla chips and frosty margarita. 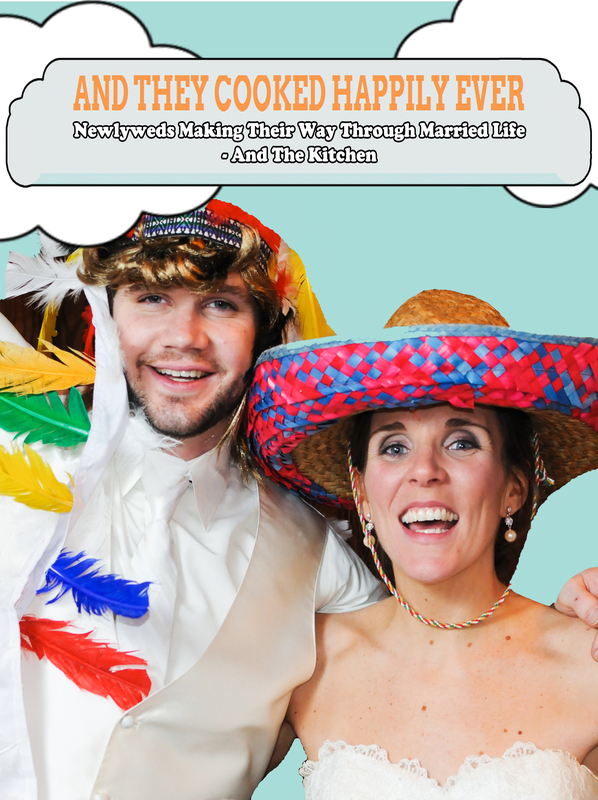 The salsa sounded delish, and the blog post associated with it was even cuter, as she dished to readers about her surprise engagement! Love engagement stories! So I added it to the recipe ‘que’. 1) In a large skillet, heat olive oil over medium heat. Add minced garlic for about a minute, until fragrant, then add chopped onion and cook for about a minute more. 2) Add the tomatoes and tomatillos to the onion & garlic and sautee for 2-3 minutes, until tomatoes become tender, but not cooked through. 3) Add the corn to the mixture last, and sautee for about a minute more. 4) Transfer the tomato/onion/corn mixture to the food processor. 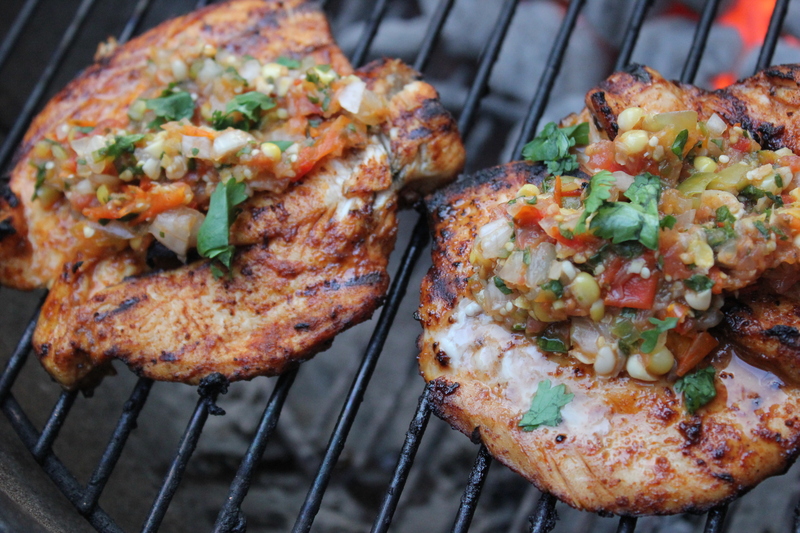 Add cilantro and pulse until you reach your desired consistency. 5) Transfer the pureed salsa mixture to a large mixing bowl. Let cool for about 10 minutes. Then season with chili powder, lime juice and salt and pepper. Oh boy was this yum! By sauteeing the vegetables, I saved a little bit of time vs. roasting them in the oven, but was still able to get that ‘roasty’ flavor vs. when you make the salsa with the vegetables in their raw form. It’s crazy the difference in taste between the two! 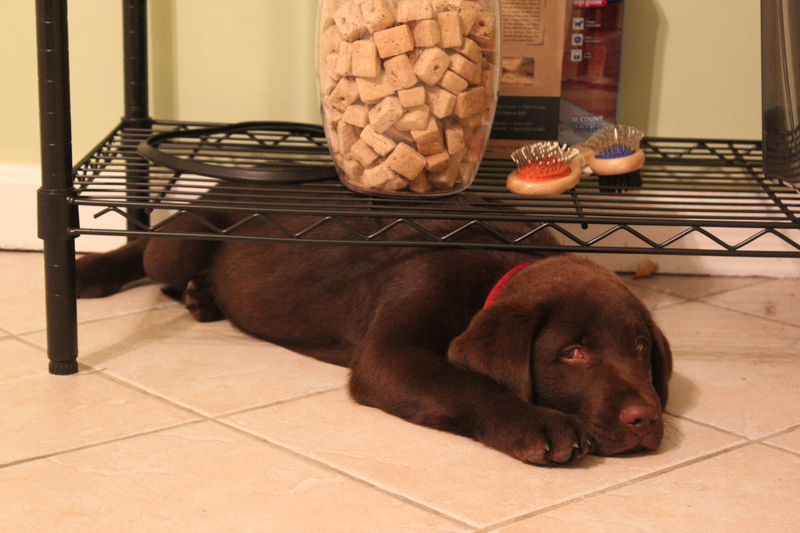 I was so preoccupied with Salsa, I didn’t even see my little buddy getting himself stuck underneath the shelf – someone apparently doesn’t know just how big he’s getting! Wait a minute – I’m getting ahead of myself here. It’s pouring rain outside right now – can you tell that I’m fantasizing as I’m typing this? 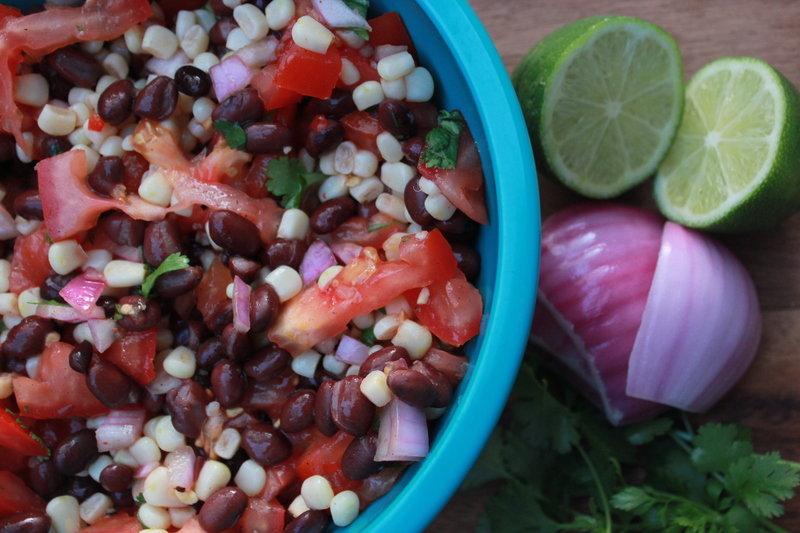 Well back to the rainy reality of the moment – until the time comes that you can be waited on hand and foot by a cute cabana boy, try this Black Bean, Corn and Tomato Salad. 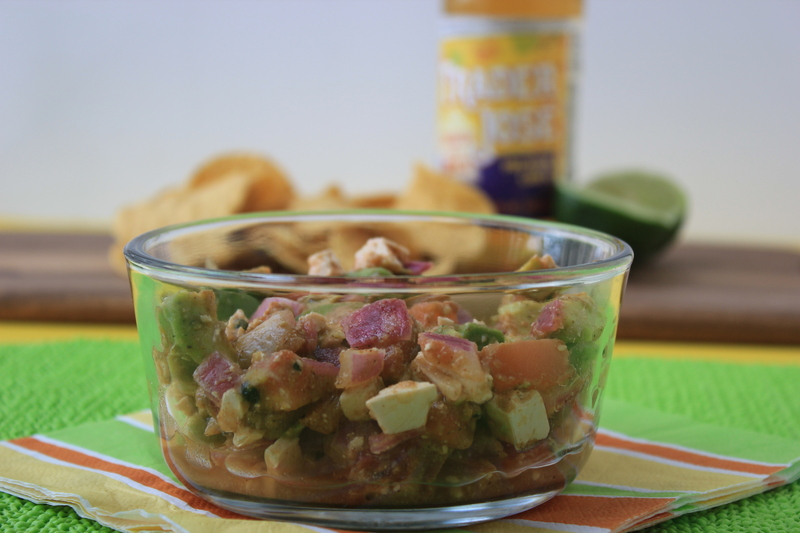 It went perfectly with steak that we made on the grill, but it could also serve as a hearty salsa with salty chips and icy margharitas. 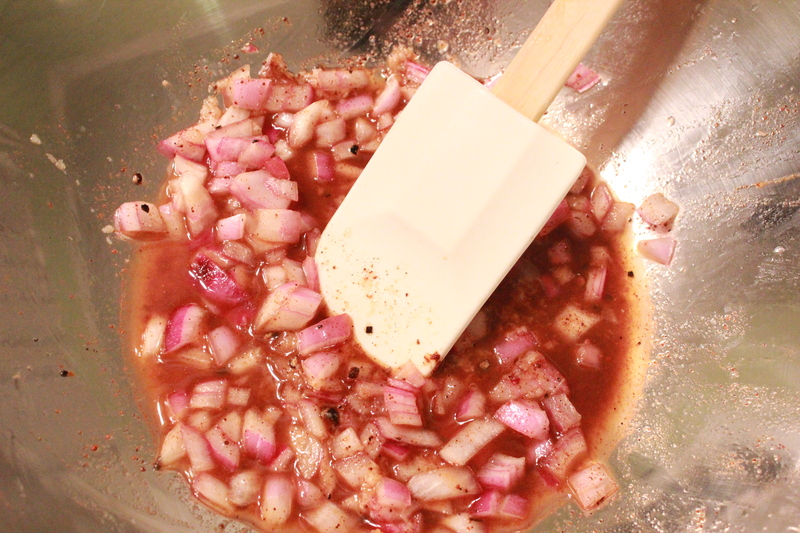 1) Combine red onions, lime juice, minced garlic, chili powder, italian dressing, and salt and pepper in a medium bowl. Set aside. 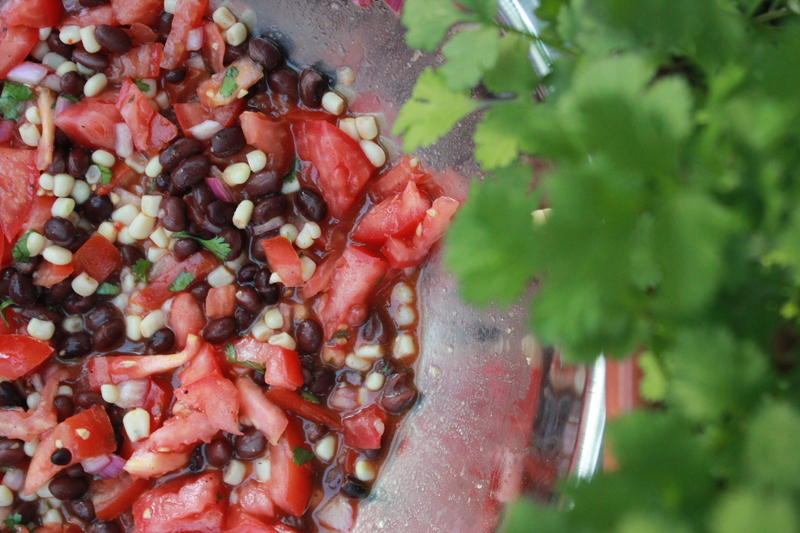 2) Add chopped tomatoes, black beans, corn and cilantro and let sit at room temperature for about 1/2 hour. I know this past weekend was all about celebrating mexican heritage, but what’s wrong with giving a shout out to the Greek culture as well? They have equally as delicious food – greek salad, those grape leave things, gyro’s, which I never pronounce correctly ever. Firstly, I think avocados are one of the neatest vegtafruits in the world (some say it’s a vegetable – some a fruit – tomato, tomaaaato) I especially love that big pit in the middle. Perfectly round and brown – I always feel bad throwing it away. And while I love the fabulous vegtafruit that an avocado is, I only like it in certain things – well scratch that, I only like it in guacamole. Something about the texture of it on it’s own skeeves me out a little bit. Dave doesn’t like it at all (he’s so picky for a boy) so when I made this Greek Guacamole, I really had the tough job of eating it all by myself. The things I do for this blog – oye. I had some version of this last summer, and it’s stuck with me since then. So to accompany our Brisket Tacos, it was Greek Guacamole. It really is delicious – doesn’t make a whole lot, so I’d advise doubling the recipe for a bit of a crowd. 1) In a large mixing bowl, lightly stir together avocado, onion and tomatoes. Add the lime juice immediately after to prevent the avocado from browning. 2) Add remaining ingredients and gently toss together until combined. 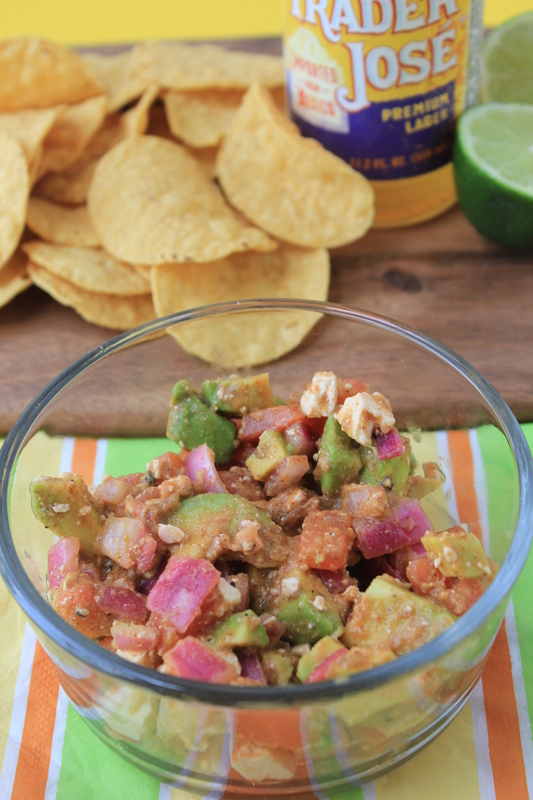 I could eat this until I was blue in the face (or green) – it’s a great summer time snack, and not too bad for you either, besides the avocado (which has the good fat…riiiiight) and the feta.